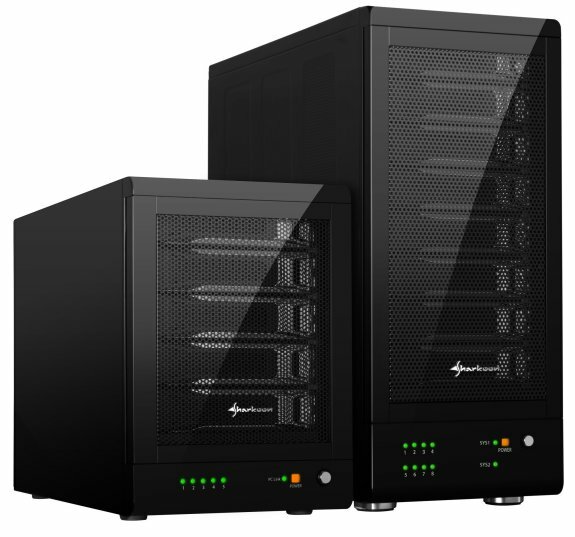 Sharkoon is expanding its assortment of external RAID hard drive enclosures: The Sharkoon 5-Bay RAID Station and the Sharkoon 8-Bay RAID Station contain both 2.5 and also 3.5 inch SATA hard drives. With its fast RAID controller, simple handling and high-quality finish, they together form a perfect base as a fail-safe backup system for private media collections or SOHO environments. Both cases are presented in a classy medal design from black SECC steel. Concealed behind the plastic front door with a mesh insert is the mounting frame for hard drives in both 2.5 and 3.5 inch formats. The frames with screwed in place storage mediums can simply be slide in place and locked by a lever. To cool the hard drives, a 120 mm silent fan is pre-installed in the rear panel. The Sharkoon 5-Bay RAID station with, five mounting frames, supports RAID levels Clean, Large, Clone, R0, R1, R3, R5 and R10. The modes Clone, R1, R3, R5 and R10 provide an automatic rebuild function for a replacement or Hot-Spare disk. The enclosure measures 282 x 150 x 215 mm and weighs 4 kg. The electricity is supplied through a 250 Watt power supply. The Sharkoon 8-Bay Station, with eight mounting frames, supports the RAID modes Clean, Large, R00, R30 and R50 including the automatic rebuild function for the modes R30 and R50. The 340 x 150 x 340 mm wide and 6.5 kg enclosure is equipped with a 300 Watt power supply and additional mesh ventilation inserts on each side. The RAID mode is simply set on both models via the DIP switches on the rear panel. Front LEDs indicate operation, disk activity and rebuild mode. The connection to the PC occurs via USB3.0 or eSATA, a slot bracket with SATA port and an internal eSATA cable are included. When connected via SATA the RAID Stations support the port multiplier function, SATA speed autonegotiation, Hot-Plug in Clean mode, port multiplier aware and non-port multiplier aware host in RAID mode, Native Command Queue (NCQ), asynchronous signal recovery, Spread-spectrum clocking, BIST, Loopback mode, 48-bit LBA addressing, and asynchronous notification. OHCI, UHCI and EHCI are all supported when connected through USB. End customers will find the Sharkoon RAID Stations available from authorized retailers.